Yesterday, we got to know Leonarda Cianciulli, who turned her victims into soap and cake. Here’s another in our series on female serial killers: North Carolina’s Velma Barfield, the “Death Row Granny” who poisoned four and maybe more, including her own mother, and was executed in 1984 at the age of 52. 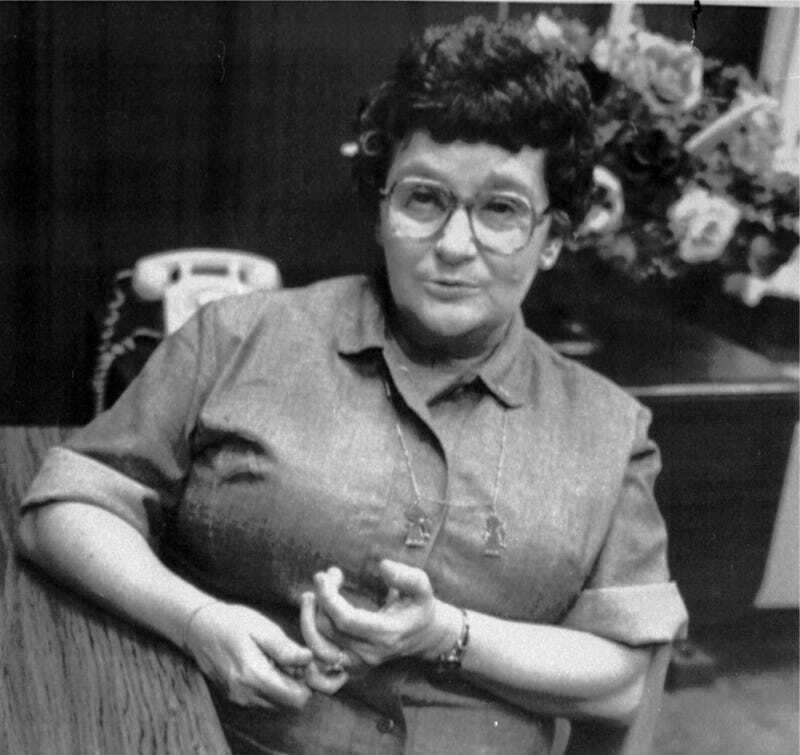 Despite her age, her soft Southern drawl, and her kindly countenance (in true grandma style, she loved to crochet dolls), Barfield was a confessed serial killer. All of Velma’s victims were done in by arsenic that she’d added to their food or drink. (Taylor died after drinking a poisoned beer.) All were publicly mourned by Barfield, who attended everyone’s funeral and seemed to genuinely mourn each victim. Her motive was, as it often is, money. She’d become addicted to prescription drugs after having a nervous breakdown, and her behavior became increasingly erratic; she was hospitalized for overdosing on four occasions. To pay for her habit, she stole from each of her victims. Between murders, she managed to get arrested for writing bad checks. The 1978 murder of Taylor, her final victim, was her biggest misstep. The other victims had all been elderly, but he was in good health and also had a close relationship with his daughter, who grew suspicious at his sudden death and insisted on additional tests during his autopsy. When arsenic was found in Taylor’s tissues, Velma, under police questioning, confessed to poisoning him as well as Lee, [Edwards], and her own mother. Later their bodies were exhumed. Arsenic was found in all of them—and in the body of Jennings Barfield, Velma’s second husband, who died in 1971 and whom she denies poisoning. Charged with Taylor’s death Velma was defended by a court-appointed lawyer. The local prosecutor was Joe Freeman Britt, whose prowess in capital cases had earned him a listing in the Guinness Book of World Records as the nation’s “deadliest prosecutor.” The court denied her plea of not guilty by reason of insanity. In her defense Velma testified that she had intended to keep her victims ill until she could repay the money she had stolen and earn their gratitude by nursing them back to health. She needed the money, she said, to pay for a host of prescription tranquilizers, antidepressants and amphetamines to which she had become addicted. That theory collapsed when the prosecution pointed out that there is a treatment for arsenic poisoning. As Taylor was writhing in agony at the hospital, Velma pretended to know nothing. Had she been interested in keeping him alive, Velma would have told the doctors what really was wrong with him, and they might have been able to save him. Her strength was in her sweet, befuddled grandmotherly image, but that took a crushing blow when she took the stand, and the prosecutor laced into her. She responded with sarcasm and snarls, destroying the one thing - her facade - that might have kept her off Death Row. But in the end, wearing pink pajamas after a last meal of Coca-Cola and Cheez Doodles, she died by lethal injection as capital punishment opponents protested outside the prison. Gov. James B. Hunt Jr. of North Carolina strongly defended his decision ... to deny clemency for Mrs. Barfield, and described it as the kind of ‘’tough decision’’ he has often had to make as Governor. Mr. Hunt, a Democrat, is in the final days of a close and bitterly fought race for the Senate here with Jesse Helms, the Republican incumbent. Aides to Mr. Hunt, who canceled his campaign schedule today because of the execution, concede they are concerned over the possible effect the execution, so close to Election Day, might have among voters. In his most extensive public remarks to date on the execution, Mr. Hunt denied that politics had anything to do with his decision to allow the execution. He also reaffirmed his strong support for the death penalty. Public opinion surveys show capital punishment is supported by a majority of voters in North Carolina. Hunt ended up losing—in the most expensive non-presidential election up to that point, by the way—and Velma Barfield made her own history by being the first woman executed in America in 22 years. Top image: Velma Barfield is shown during the taping of an interview in October 1984. AP Photo.